So for those who don’t know me well, I love food. I’m not a foodie, but that’s simply because I don’t know what being one entails, and don’t want to make that commitment. In Paris specifically, they’re incredibly proud of their produce, cheese, bread, whatever. It’s to the point that in the supermarkets there are sad bunches of foreign apples that are ostracized from the French apples. And as I stared at those sad, untouched, and overripe apples, I couldn’t quite understand how they were that different. And to gain a better understanding of local produce in Paris, I planned a day trip to a pick-your-own French farm. Luckily you can get here by the Paris train system. Getting to the farm is the same way one would go to Versailles. Take the metro to the Montparnasse train stop. Follow signs to the suburban trains. You will need to exit the metro area, but stay in the station. Then buy a separate ticket for the N train. Buy a ticket for the Gare de Versailles Chantiers stop. Navigate to the platform with the N train. Once on the train there’s no need to check for your stop. Versailles Chantiers is the last stop on the line. Leave the station and walk toward the Versailles Palace. I’d recommend buying a ticket for Versailles and walking directly through the gardens. The whole area is lush, so if you don’t buy one, no worries. However, it’s a shorter distance and you get to see the palace. Exit the gardens and follow the path toward the farm, you'll be going east. There will be a large sign that announces Les Fermes des Gally. Voila! You have arrived. There’s a huge sign with an overview of the in-season produce to pick. Also, have no fear if you’re completely clueless on how to actually pick the goods. There are helpful signs with easy to follow directions that detail how to harvest each crop. 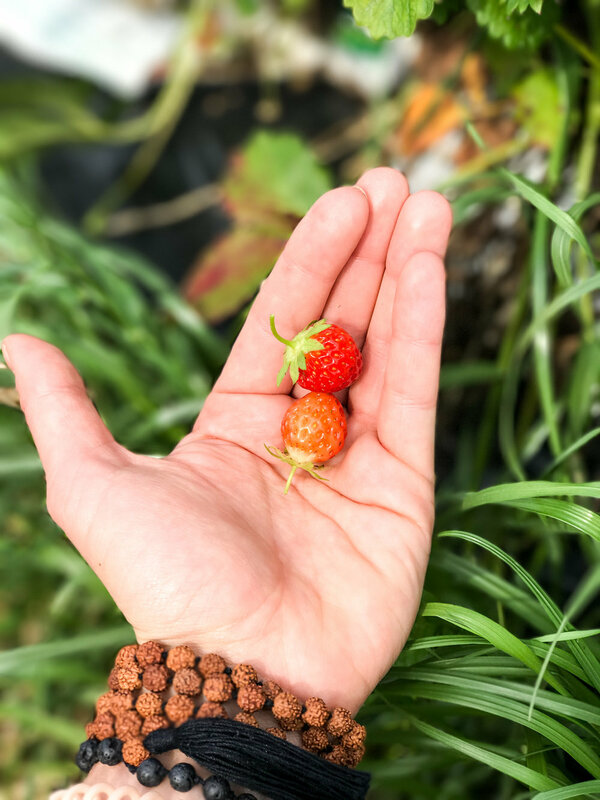 I went in early June so the in-season crops were spinach, snap peas, salads (which are lettuces), carnations, lilies, watercress, and of course, strawberries. I would go again in a heartbeat. 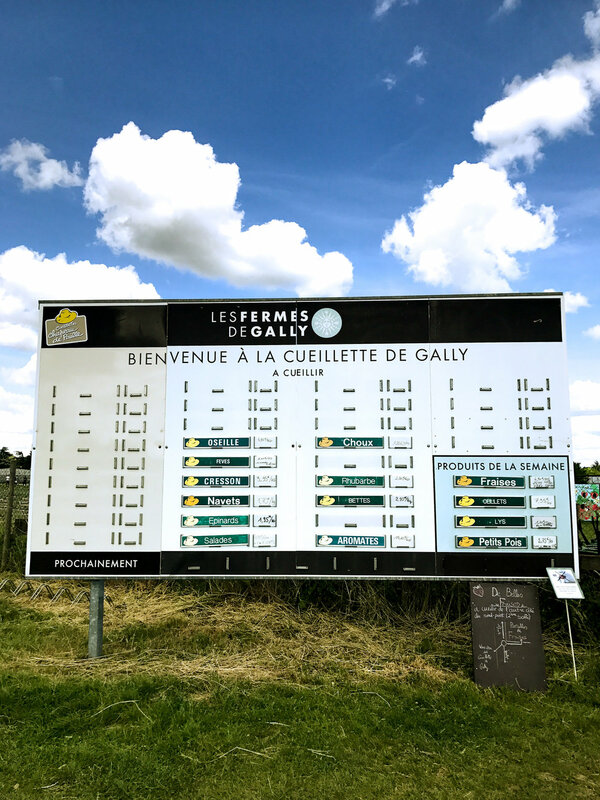 The trip to Les Fermes des Gally provided an alternative perspective to French culture, I got a break from the chaos of Paris, and had beautiful, healthy groceries that lasted over a week. In other words, I ate an obscene amount of fresh strawberries for a fraction of the price. **I’m chuckling to think that regardless if it is fashion or produce, Parisians are always in season. Read more here for insight on locally grown & organic produce. Does it really matter?